The Historic Town Survey project examined the archaeology, topography and standing buildings of the town of Bangor. The project is part of a wider pan-Wales series of studies being carried out by the Welsh Archaeological Trusts and funded jointly by Cadw and the relevant local authority. By their very nature towns undergo regular re-development as structures, and even street patterns, change to meet new demands and interests. But for those who manage the urban environment, a sound knowledge of the history and archaeology of the town, and a clear understanding of what forms its character, is essential if that special 'sense of place' is to be retained. Characterization allows better understanding of the various factors that combine to create the distinctive qualities of the settlement and its ‘sense of place’. The process relies upon a clear understanding of the historic development and urban topography, together with a visual assessment of the surviving historic fabric, including distinctive architectural forms, materials and significant elements of town and streetscapes. The origins of Bangor are thought to derive from the establishment of an early Christian settlement here in the 6th century. Though the nature of the settlement remains elusive, there are sufficient references to an early church at Bangor to acknowledge the presence of a monastic settlement of at least regional importance. This was maintained in the Middle Ages by the creation of Bangor as the centre of the newly formed Diocese, and the construction of the cathedral. 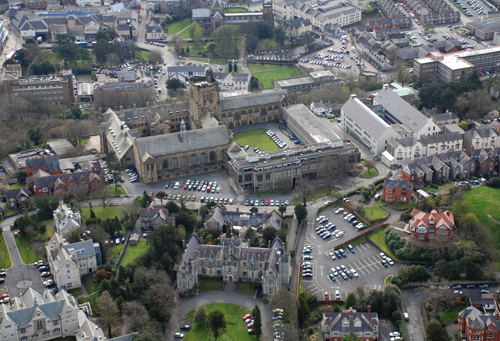 The slow growth of Bangor from a Cathedral and church-oriented settlement to a commercial centre of importance, and the recognition of transport routes as a catalyst within this process, is identified. Industrial growth, led by Richard Pennant of Penrhyn in the late 18th century, encouraged a boom in house building, and the sale of agricultural lands within the valley for urban and industrial development. A subsequent decline in the extractive and transport related industries was off-set by the growth of educational institutions in Bangor, and these have, throughout the course of the 20th century, been significant forces within the physical and social development of the city. It was the intention at the outset of the project to carry out the work with the full knowledge, help and co-operation of relevant local historical groups. As a consequence of this, both talks and field visits were arranged and undertaken in conjunction with the Bangor Civic Society, the Friends of Gwynedd Museum and Art Gallery and the Friends of Gwynedd Archaeological Trust. All the groups contributed to the project.